About this Steel Threads Acrylic Identification Tag (Gray):Secures with metal cord. Holds standard business card. Manufactured By Leeds. Materials: Brushed AluminumSpecial Instructions:Other imprint methods/areas may be available; please call for details. Please note that product images may not depict the standard imprint method included in pricing. About this Omicron Identification Tag:Metal wire with twist action closure to attach tag to luggage or strap. Manufactured By Leeds. Note: Instructions Included: No Materials: Aluminum Related Search Terms: Identification TagSpecial Instructions:Other imprint methods/areas may be available; please call for details. Please note that product images may not depict the standard imprint method included in pricing. About this Dog Tag:Great Conversation Piece.28" Ball Chain.Colorful Silicone Border.Special Instructions:Multicolor imprint is available, Please call for service.Rush Service:Catalog Quantities Only.One Color And One Location. About this Dog Tag:Your brand will be barking up all the right trees when it's imprinted on these customizable keepsake dog tags!Offered in an array of classic colors, reinforce your company image using these fashionable accessories around the necks of your customers.Made of anondized aluminum, these durable and long-lasting tags hang off a 34" beaded chain.A creative and versatile giveaway at any promotional event!Material: Aluminium NOTE: Product comes with Prop 65 warning label. Label reads: "WARNING: This product may contain carcinogen, which is known to the State of California to cause Cancer and Reproductive Harm. For more information, go to www.P65Warnings.ca.gov. Special Instructions:Rush Service:May only be used on regular web quantity orders and one color imprints. About this Dog Tag with 4 1/2 Ball Chain:Lightweight and durable. Beaded Chain approx 4 1/2". Anodized Aluminum Material.Special Instructions:1 Day Rush: 1 color, 1 location. PMS color matches are not available with 1 Day Rush.Warning: Choking Hazard. Small parts. Not for children under 3 ys. About this Dog Tag with 23 1/2 Ball Chain:Lightweight and durable. Beaded chain approx 23-1/2". 6 Colors available.Anodized Aluminum Material.Special Instructions:1 Day Rush: 1 color, 1 location. PMS color matches are not available with 1 Day Rush.Warning: Choking Hazard. Small parts. Not for children under 3 ys. About this Millennium Leather Identification Tag:Holds a standard business card. Adjustable metal buckle. Flap cover with snap. Manufactured By Leeds. Note: Instructions Included: No Materials: Millenium Leather Related Search Terms:Identification Tag Special Instructions:Other imprint methods/areas may be available; please call for details. Please note that product images may not depict the standard imprint method included in pricing. About this Dog Tag Key Tag:Add some "drive" to your upcoming promotional event with this terrific marketing tool.Our Falcon Dog Tag Key Tag is an anodized aluminum dog tag with steel key ring.Add your company's logo to this item to create a handy giveaway to distribute during tradeshows and conferences.Clients will think of your brand when searching for their car keys.Material: AluminumSpecial Instructions:Rush Service:May only be used on regular web quantity orders and one color imprints. About this Dog Tag , 23-1/2 Ball Chain with Full Color Digital Imprinting:Lightweight and Durable.Beaded Chain approx 23 1/2" .6 Colors available.Anodized Aluminum Material.Special Instructions:3 Day Rush: 1 location imprint.Warning: Choking Hazard. Small parts. Not for children under 3 ys. About this Dog Tag , 4-1/2 Ball Chain with Full Color Digital Imprinting:Lightweight and Durable.Beaded Chain approx 4 1/2" .Anodized Aluminum Material.Special Instructions:3 Day Rush: 1 location imprint.Warning: Choking Hazard. Small parts. Not for children under 3 ys. 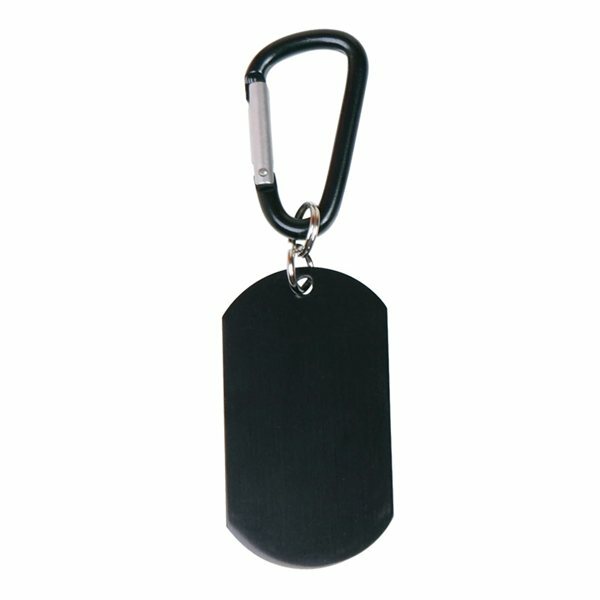 About this Dog Tag:An ideal promotional item for colleges, universities, sports teams or any company or organization. The dog tag is an instantly recognizable and beloved accessory. About this Ball Chain Dog Tag - Laser Engraved:Unite people for any cause under this classic symbol of strength and teamwork. These dog tags are designed with a clean, minimalist style and an anodized aluminum construction. Perfect for distributing during trade shows, conventions, and outdoor campaigns. Comes complete with your choice of a 5" or 24" ball chain. These dog tags come customized with a laser engraved representation of your company name and logo. About this Ball Chain Dog Tag - 4 Color Process Dome:Unite people for any cause under this classic symbol of strength and teamwork. These dog tags are designed with a clean, minimalist style and an anodized aluminum construction. Perfect for distributing during trade shows, conventions, and outdoor campaigns. Comes complete with your choice of a 5" or 24" ball chain. These dog tags come customized with a full color imprint of your company name and logo under a protective epoxy dome. About this USA Heaven Scent(TM) Dog Tags:VibraColor Dome is optional.USA-made wearable plastic dog tag with ball chain.Fun, memorable Heaven Scent™ aromas built in! About this Busker Leather Keychain with Antique Nickel Carabiner:NEW BUSKER debossed leather keychain with antique nickel carabiner and split ring.Choose from 6 domestic, USA Made, leather colors and customize to match your company logo with 11 Irish waxed linen accent stitching colors to create something truly unique. Colors and distress marks will vary - Variations found in natural leather. 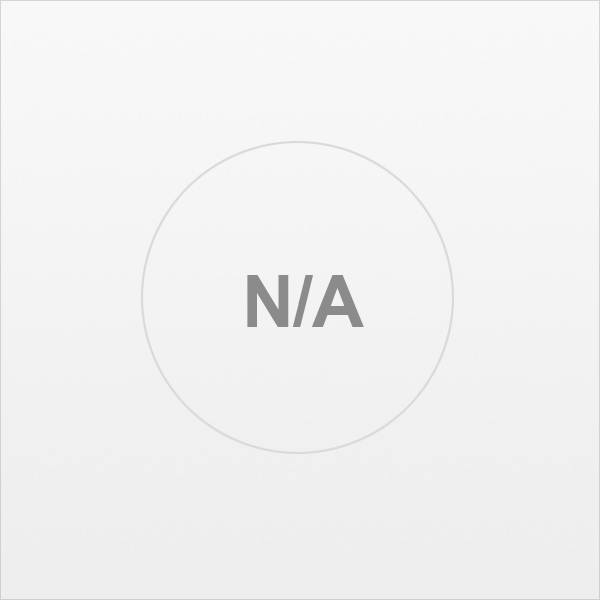 About this Dog Tag Lanyard:Anodized aluminum dog tag with 24" chain. NOTE: Product comes with Prop 65 warning label. Label reads: "WARNING: This product may contain carcinogen, which is known to the State of California to cause cancer, birth defects and other reproductive harm. For more information, go to www.P65Warnings.ca.gov. About this Dog Tag:These dog tags are metal with a silicone border. Includes 23" beaded neck chain. About this Plastic Ball Chain Dog Tag:Unite people for any cause under this classic symbol of strength and teamwork. These dog tags are designed with a clean, minimalist style and a laminated card stock construction. Perfect for distributing during trade shows, conventions, and outdoor campaigns. Comes complete with your choice of a 5" or 24" ball chain. These dog tags come customized on one side with a full color representation of your company name and logo. About this Plastic Dog Tag w / QR Code:Unite people for any cause under this classic symbol of strength and teamwork. These dog tags are designed with a clean, minimalist style and an anodized aluminum construction. Perfect for distributing during trade shows, conventions, and outdoor campaigns. Comes complete with your choice of a 5" or 24" ball chain. These dog tags come customized with a full color imprint of your company name and logo under a protective epoxy dome. These dog tags also feature a QR code that allows recipients to gain instant access to your website through their smartphones! About this Plastic Ball Chain Dog Tag w / QR Code:Unite people for any cause under this classic symbol of strength and teamwork. These dog tags are designed with a clean, minimalist style and feature a plastic construction. Perfect for distributing during trade shows, conventions, and outdoor campaigns. Comes complete with a 24" or 5" ball chain. These dog tags also feature a QR code that allows recipients to gain instant access to your website through their smartphones! About this The Armanno Dog Tag:A stainless steel dog tag on a 12" long metal beaded chain. For permanent imprint, this item is laser engraved. Includes a gift box. NOTE: Product comes with Prop 65 warning label when shipped to California. Label reads: "WARNING: This product may contain carcinogen, which is known to the State of California to cause Cancer and Reproductive Harm. For more information, go to www.P65Warnings.ca.gov. Special Instructions:24 Hour Rush must be 1-color / 1 location only. About this Dog Tag Necklace:An aluminum metal dog tag on 10 1/2" long metal beaded chain. For a permanent imprint, this item is laser engraved.This product is not intended for children 12 and under. NOTE: Product comes with Prop 65 warning label when shipped to California. Label reads: "WARNING: This product may contain carcinogen, which is known to the State of California to cause Cancer and Reproductive Harm. For more information, go to www.P65Warnings.ca.gov. Special Instructions:24 Hour Rush must be 1-color / 1 location only. Thank you Mary, Jeremy and Derek for your positive reviews on our Dog Tag on Bead Chain! Our Dog Tag on Bead Chain is a fun item to give for any event! You’ll be able to identify all of your customers with this neat marketing tool. Allow your customers to represent your company in a fashionable way. Classic military-style dog tag with traditional necklace bead-chain. Bead chain and dog tag both made of aluminum. Available in blue, black, red, and silver. Purchase your Dog Tag on Bead Chain now! Thank you Mary and Colton! This Luggage tag helps pop out which luggage is yours! 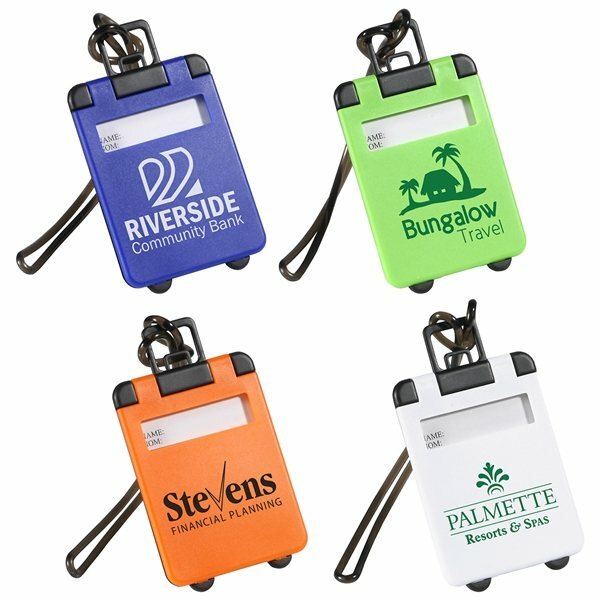 Allow your company name to travel along with this luggage tag. With this luggage tag, you’ll be able to write inside all the important details you need to help identify your bag! Your luggage will never get lost with this tag! Easy View Name Through Front Window. Opens Up For Full Luggage Information. Available in blue, green, orange, and white. Purchase your Travel Tote Luggage Tag today! Thank you Steve and Eli! We’re glad to read your positive reviews about our promotional Dog Tag on Carabiner. Classic military-style dog tag with functional mini-carabiner attachment. Carabiner and dog tag both made of aluminum. Available in red, blue, black, and silver. With 150+ ID and dog tags available in our selection, you’ll be able to identify all your customers in no time. We have identification tags, dog tags, dog tags on carabiner, dog tags on bead chain, leather identification tags, dog tags with ball chain, dog tag necklaces, dog tag key tags, and more! ID and dog tags are fun for anyone! Dog tags are not only popular in the armed forces, but also in schools. Elementary schools are making the comeback with dog tags for students to help promote safety. Check out our custom ID and dog tags in our selection! Our fun ID and dog tags will make a popular promotional item for your company! The emphasis that we place on brand impact mirrors that of our customers, demonstrated by our vast selection of promotional items. Look through our selection of event ID and dog tags, and see for yourself. Our trade show dog tags and more are proven to generate impressions. Click through our inventory of ID's and dog tags on sale now. Here are just a few of the event products that are currently available and ready for ordering through our helpful staff. Give us a call! Get your custom dog tags and more today! Are you promoting safety? ID and dog tags are just the promotional items you need! Help identify your group of customers with our ID and dog tags. Not sure which Id or dog tag to get? With our selection, you’ll find that perfect one in no time. If you need help selecting the perfect option, feel free to reach out to our customer service team through our live chat! Our featured list includes our top trending custom ID and dog tags. Don’t miss out on this fun way to market your company logo!